Motorola PRO+ is a business oriented smartphone which features 3.1-inch VGA (640 x 480) Gorilla Glass touchscreen display with full QWERTY keyboard and is powered by 1GHz single-core processor processor with 512MB RAM. It is equipped with 4GB of built-in storage and can be expanded up-to 32GB. 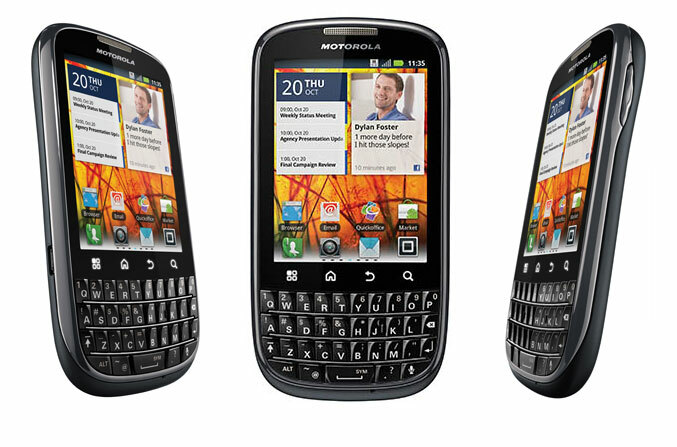 Motorola PRO+ runs on Android 2.3 Gingerbread OS and sports 5MP autofocus rear camera. Network connectivity options include quad-band GSM/GPRS/EDGE and dual-band 3G/HSDPA, 3G Mobile HotSpot capabilities, GPS, Wi-Fi, Bluetooth. Sensor option includes Multi-touch input, Accelerometer sensor for UI auto-rotate, Proximity sensor for auto- turn-off and Digital compass. The PRO+ is packed with Quickoffice Connect for accessing, creating and editing documents on-the-go and with 25 Exchange ActiveSync security policies – including PIN lock, auto-discovery of Exchange Servers, Extended Device Management API’s and 3LM integration. Other option includes USB 2.0 port, microSD card slot and comes with 1600mAh battery. It comes with a dimension of 62 x 119.50 x 11.65mm and weighs 113gms. The battery delivers and provides Up-to 312hrs of Standby, Up-to 8hrs of talk-time. The Motorola PRO+ will be available in Asia and Europe from October. Tags:motorola pro+, motorola pro+ features, motorola pro+ specifications, motorola pro+ review, motorola pro+ details, motorola pro+ availability, motorola pro+ specs, motorola pro+ images, motorola pro+ pics, motorola pro+ pictures, motorola pro+ imgs, motorola pro+ price,motorola pro+ network options, motorola pro+ expansion options, motorola pro+ multimedia features, motorola pro+ sensor options, smartphones, android 2.3 gingerbread os smartphones.